Blind Pig who wants to fly (Indonesia): surrealistic, wonderful disorientating, puzzeling visual poetry. Quote: ‘Schiet met je boog, maar niet in mijn oog. Want mijn oog is voor iedereen, en mijn hart alleen voor jou.’ I just called to say I love you by Stevie Wonder will never sound innocent again. Also see Dana Linssen’s excellent review about this weird film. Native Dancer (Kazakhstan): magical film about some crooks (petrol dollar gangsters) and a healer. The story is based on an real character who lives about seven kilometres outside Almaty. An intense story, with a heart breaking ending: neither happy, nor sad. Director Gulshat Omarova witnessed several rituals (seldom without blood) and told in the Q&A she sincerely believes in the power of this witchcraft. Currently Omarova lives in Rotterdam: ‘a great city to write scenarios’ and she travels to Kazakhstan three, four times a year. In 2006 she was asistant director of The Mongul. 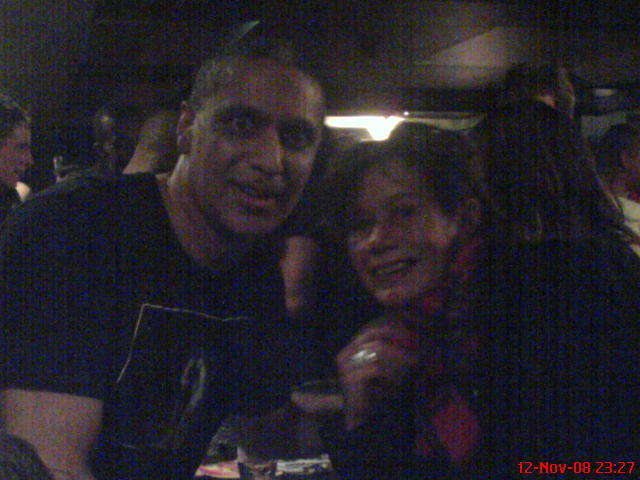 Last night Nitin Sawhney performed in Amsterdam. His concert in de Melkweg was part of the Amsterdam India festival. This concert tour is also to promote his latest album, London Undersound. It discusses how London has changed in the last few years – particularly since the London bombings of 7/7/2005. The album tells how Nitin and his collaborators have perceived that change. I always try to attend his concerts in Holland because a night with Nitin is a wonderful experience. He is serious and playful, he has with a nose for good musicians and he dares to be silent. Years ago he started mixing flamenco, Indian voices and tablas, drum’n’ bass, rai etcetera. The result might sometimes be a bit slick, but most of the times wonderful balanced and surprisingly powerful. As was the case last night in the packed Melkweg. After the concert he signed the new cd, as he did two years ago after his concert in Paradiso. Like real fans, I took a picture of my old-time friend Astrid with our hero. Last night a rumour was spreading Nitin and Natacha Atlas will perform together in 013 in Tilburg, somewhere mid January. That really sounds tempting! I will certainly reserve some space for this event in my new agenda. Have a look at and listen to Nintin Sawhney on You Tube. Enjoy! Iedere woensdag werd Folia opgemaakt op de zetterij van Vrij Nederland in een zijstraat van de Kalverstraat. Op een dag sta ik in de lift met een zeer gedistingeerde dame die me bekend voorkomt. Het blijkt prinses Irene, die onder kantoortijd een bezoekje brengt aan haar dan nog geheime scharrel, Vrij Nederland-hoofdredacteur Joop van Tijn. Onder de sollicitanten voor een jaarcontract als leerling-redacteur was er een die een knoop op tafel legde. ‘Deze knoop’, zei hij, ‘komt van het colbert van minister Deetman. Die heb ik er persoonlijk van afgerukt bij de opening van het P.C. Hoofthuis.’ Voor de sollicitatiecommissie stond de geschiktheid van de kandidaat daarmee onomstotelijk vast. De jongeman werd aangenomen en heeft nog jaren voor Folia gewerkt. De getalenteerde en veelzijdige leerling-redacteur Beau van Erven Dorens werd op reportage gestuurd naar OV-jaarkaart BV in Rotterdam, om hem ook eens iets serieus te laten doen. De dag erop bibberde een fax binnen van de directeur: er zaten nogal wat fouten in het conceptartikel. Maar verder was de Folia-verslaggever ‘toch wel een lieve jongen’ geweest met bovendien ‘een lekker kontje’. De naam van de directeur van OV-jaarkaart BV: Pim Fortuyn. The Ruhnama (book of the soul) is in the West an unknown book. But for most youngsters in Turkmenistan it is the only book they know, sometimes even by heart. It is taught on every school and is supposed to be the most important and most of the times only schoolbook. Every student should have read the book several times, according to Saparmurat Turkmenbashi, late president-for-life of Turkmenistan. The book describes his life and experiences. Pages are filled with advice for the right Turkmen lifestyle according to the president and of course according to Allah. Former president Turkmenbashi processed his biography along with his ideological ideas in this book. After his death, the personality cult and the strange rules he set hardly diminished. Last year I attended the screening of Shadow of the Holy book at the International Documentary Festival Amsterdam (IDFA) . The film of investigative journalist Arto Halonen shows that companies such as Nokia, Siemens and John Deere have to organize a translation of the Ruhnama in their language, in order to get approval for doing business in Turkmenistan. The film exposes the immorality of international companies doing business with the dictatorship of oil-and-gas-rich Turkmenistan. English, French and German translations of the book exist but would there also be a Dutch edition, I wondered. After some half-heartily search on the internet, the question vanished to the background. 07/06/2008 Iran: Lamb or Lion? One of her most amazing memories of Tehran is about a circus where she saw a lady with a purple chador riding in circles on a horse. Carolien Roelants, a journalist for the Dutch daily NRC Handelsblad, has made so many trips to Iran that she stopped counting them. Although she doesn’t speak Farsi, she tries to get a familiar picture of the country and its people as possible. During her trips to Iran, she speaks to a broad range of people: supporters of the conservative regime as well as members of the opposition, young and old, women and men. Roelants work – background stories, reports and interviews – is published in NRC Handelsblad. Last week the publisher launched a new edition of Roelants book: Iran behind the Scenes, Mullahs and Maidens’ (Iran achter de schermen, mullahs en meisjes). The book launch was combined with a discussion in the debating centre De Rode Hoed.